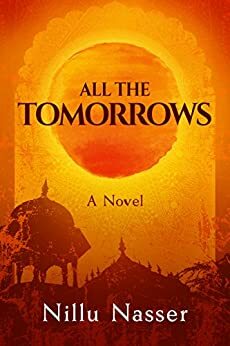 Midwest Book Reviews says, "Replete with hard lessons, determined dreams, and illusions and realities surrounding love and relationships, All the Tomorrows is a gripping saga set under the sweltering heat of not just India, but hearts on fire." Romuald Dzemo, Readers' Favorite Book Reviews (5 Stars), says, "All the Tomorrows by Nillu Nasser is a gripping tale of love and betrayal... The story is compelling and original, and it immediately transports the reader into the heart of a culture, a setting that reflects the thrills and perils of Bombay, capturing powerful images of the place in vivid clarity, from the dust of the overcrowded streets to the morality of Bombay. The characters are memorable, well-developed, and deeply explored. The conflict is strong and the reader is captivated as it escalates into a crisis point. All the Tomorrows is a wonderful read and the humanity that is injected into the writing will greatly appeal to readers. Nillu Nasser is a gifted and a great entertainer. This novel is balanced and utterly engrossing." AUTHOR: Nillu Nasser is a writer of literary fiction novels. She also blogs, writes short fiction and poetry. Nillu's short story "Painted Truths and Prayer Beads" was published in May 2016 in Mosaics 2: A Collection of Independent Women. Another short story, "The Tombstone Man and the Coming of the Tigress," was published in June 2016 in UnCommon Origins, an anthology of short fiction. In 2017, "Tombstone Man" is scheduled to reappear in UnCommonly Good. Nillu has a BA in English and German Literature and an MA in European Politics. After graduating, she worked in national and regional politics, but eventually reverted to her first love. She lives in London with her husband, three children, one angelic cat and one demonic cat, though she secretly yearns for a dog. If you fly into Gatwick and look hard enough, you will see her furiously scribbling in her garden office, where she is working on her next story. Nillu's first novel, a story of sexual politics and second chances in Mumbai, is due to be published by Evolved Publishing in Autumn 2017. To find out more about Nillu and get the juice on her latest books, read her blog, send her a tweet or sign up for her newsletter. A poignant and beautifully written story, and one that threads its way through some fascinating cultural and social norms and expectations with an inquisitive eye. Perhaps a little slow and loose in some small parts, but overall a great read. 5.0 out of 5 starsA 4.5 because of ending. I love books that are set in India and this one is going to be on the top reads of other novels by Indian writers. Set in Bombay, the novel starts when Jaya, one year into an arranged marriage, discovers that her idealist, undemonstrative husband, Akash, has a lover. Criticised by her parents and feeling uncared for, her torment results in a truly shocking action by Jaya that will hold everyone involved for 20 years because of lies and betrayals. It immediately takes the reader into the heart of a culture, a setting that reflect the thrills and perils of Bombay. You can feel and taste the smells coming off the streets of Bombay. The characters are memorable and are deeply etched in our memory. But Jaya and Akash aren’t the only characters in this wonderful story who capture our hearts. There is Ruhi, the sister, who won’t let Jaya give up on herself and life. There is Firoz, who mentors Jaya’s talented artwork. There is Soraya, who surfaces again later in the story, and to readers’ delight emerges as yet another marvelous example of just how strong women are. The only negative thing for me was the abrupt ending. I felt the author owed the readers a little bit more of a finish, but maybe that is why I don't write books! A 4.5 star. Nillu Nasser leaves no doubt with this novel that her passion for life is one of extraordinary intensity. This novel is ripe with layers and textures combined with a series of twists and plot turns that are thoughtful and non compromising. Her words are exacting, the ability of her characters to come to grips with seemingly impossible situations a fascinating examination of the human psyche. Bravo Nillu.can't wait to see what you have in store for us next. 5.0 out of 5 starsA beautiful, lyrical debut not to miss! This book. I can't even begin to describe how powerful and moving this story is. Jaya and Akash are dynamic, fascinating, sometimes madding characters that will keep you turning the page just to see how their wonderful/tragic/beautiful story ends. The writing is so poignant and lyrical that you'll lose yourself in the prose. Seriously, you don't want to miss this book! One of my favorites. This is such a wonderful story to dive into. Nasser evokes the rich atmosphere of Bombay with beautiful clarity and spins a captivating story of a love lost (destroyed?) and the struggle to be re-gained. Her characters are written with obvious passion and enormous care which pulls you further and further into their lives. These are characters that will stay with me for a long time. A story that tugs the heartstrings and makes one grateful for what one already holds in life. Highly recommended.